The field is set for the 2017 Stanley Cup Finals. The Nashville Predators advanced to their first Finals in franchise history with a 4-2 series win over the Anaheim Ducks. 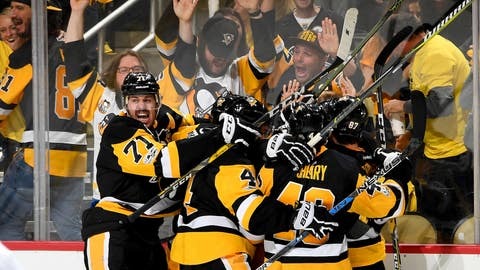 Pittsburgh needed a full series – including a double-overtime Game 7 – to advance past Ottawa. Nashville and Pittsburgh split two regular season games, with both teams winning at home. Pittsburgh definitely has a leg up in the experience department for the upcoming matchup. The Penguins are the reigning Stanley Cup champs and have won the Cup four total times. They have also been to the playoffs 11 straight years, compared to just three for the Predators. While Sidney Crosby is more familiar to the casual hockey fan, it’s Evgeni Malkin leading the Penguins in points during the playoffs. He has seven goals and 17 assists, with Crosby not far behind at seven goals and 13 assists. Pittsburgh goalie Matt Murray missed the first two rounds with an injury, but made five appearances in the Eastern Conference Finals. In Game 7 against Ottawa, he made 27 saves on 29 shot attempts and played 85 minutes. Murray should be Pittsburgh’s starter for the Finals. Nashville will counter with goalie Pekka Rinne, who has been sensational throughout the playoffs. He’s allowing just 1.7 goals per game, with a .941 save percentage. On offense, the Predators’ balanced attack includes seven players with double-digit point totals during the playoffs. Filip Forsberg leads the way with 15 points, followed by 13 from Ryan Johansen, 11 from Ryan Ellis and four players – P.K. Subban, Roman Josi, Colton Sissons and Viktor Arvidsson – with 10 points each. So which team wins? We used WhatIfSports.com’s NHL simulation engine to play the Stanley Cup Finals 1,001 times. The Penguins scored 2.81 goals per game and held the Predators to a 2.44 average, winning 57.6 percent of all simulations. The most common series outcome was a seven-game win for the Penguins.